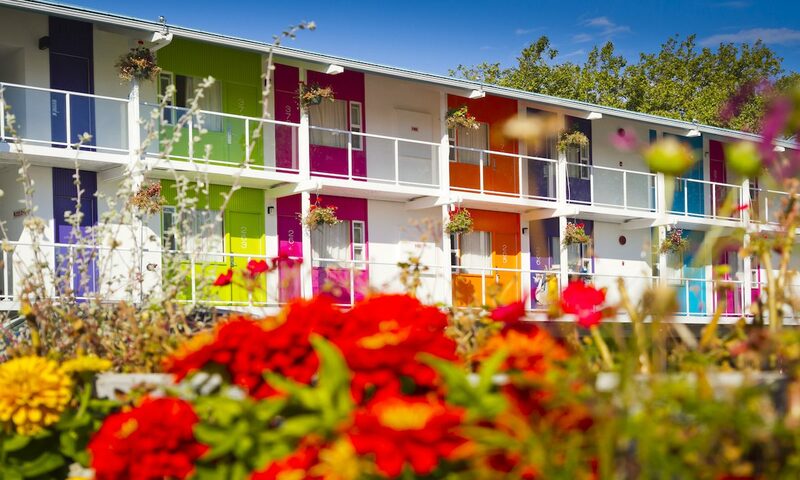 Hipsters and holidaying families flock to this funky Victoria hotel. 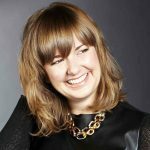 Emma Yardley is a seasoned travel and lifestyle writer with a knack for discovering hidden hotel gems around the world. Starting out in journalism as a fashion editor, Emma has a finely tuned eye for style. 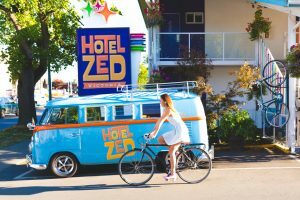 Taking a tired highway motel and transforming it into a vibrant vacation destination is no easy feat, but the folks behind Hotel Zed Victoria have nailed it. After a nearly $1-million reno, they opened up their 62 rooms in 2014 with the idea of creating an unpretentious, playful place where travelers could kick back and truly enjoy their time in British Columbia’s stunning capital city. A 10-minute drive (or a half-hour walk) from Victoria’s downtown core, Hotel Zed is located on Douglas Street (aka the main strip), opposite Mayfair Shopping Centre. To make up for not being in the thick of it, the hotel provides a free, regular shuttle to the city’s hub in a classic VW bus, free parking in their street-art covered lot as well as comped access to a fleet of bikes (single-seated and tandem) and skateboards. Since it’s minutes from the Galloping Goose Regional Trail, an expansive multiuse path that follows old railway lines from Saanich to Sooke, it’s an ideal location to safely explore the wilderness B.C. is known for on wheels or on foot. Quirky doesn’t come close to describing Hotel Zed’s aesthetic—it’s full-out funky. While staying true to its mid-century modern roots, they’ve taken a classic, 1950s roadside motel and given it a modern makeover. 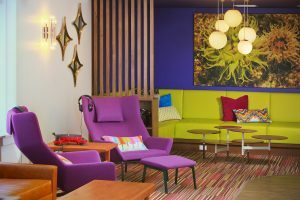 In the lobby, fuchsia recliners sit next to a lime-green sectional and are set against an electric-blue wall… there’s no grey to be found at Hotel Zed. Its retro vibe, easy accessibility and reasonable pricing attract young, road-tripping creatives as well as vacationing families, but it’s also a great option for anyone who appreciates a cool design concept. One factor that makes this hotel so appealing to a wide swath of traveler types is the variety of rooms it has on tap. From the compact bachelor pad to a two-bedroom cottage, there is a space made just for you at Hotel Zed. The “Zed Two Bed” features two comfy queen beds with crisp, white sheets and a stack of pillows to play around with until you find the perfect one for your head. 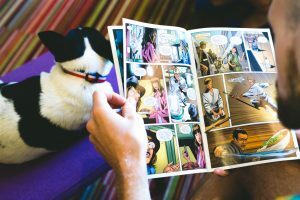 The linear design of the rooms allows for a sleek, floating suitcase bench and an ultra-modern desk, kitted out with custom-made Zed comic books, a bulletin board with local events, and a tangerine-orange, old-school rotary phone (it works—and is the room’s only phone). 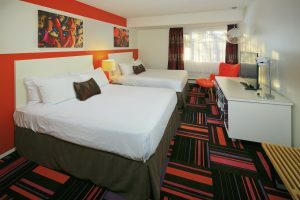 The room follows the overall retro design of the greater hotel, with psychedelic colors used in the bold street-art on the walls, the somewhat-jarring block striped carpeting, and super-soft tufted egg-shaped armchair in the corner. There’s also a 40-inch LED TV positioned on the floating desk, a mini fridge with a tiny freezer and a cool, 1950s-inspired alarm clock situated on the bedside table. The bathroom is basic but clean, with orange vinyl countertops, a simple white sink, tub shower and a hair dryer. You have everything you need to get clean, but maybe consider bringing your own bath and body products if you enjoy a higher-quality lather. The two layers of curtains blocked out the evening light (the sun doesn’t set until 9:30 p.m. in the height of summer this far north) and although the in-wall venting unit took a bit of adjusting to get right, it did provide good air flow throughout the night. The room was clean, well maintained and, thanks to 1950s-era building codes, blissfully quiet. What the hotel lacks in high-end toiletries, it makes up for with thoughtful, vacation-making amenities. While there’s free property-wide Wi-Fi, there’s also a typewriting station in the lobby, where you can tap out a spur-of-the-moment poem or love letter. A stack of board games is available to take to your room or play in the lobby next to the coffee station, with its complimentary cups of joe and tasty teas. If you’d like something a little more active, there are ping pong tables in the basement party lounge as well as Nintendo Wii terminals. While the bright colors and unusual amenities draw in the weary travelers, it’s The Ruby that brings in the local crowd. This concept rotisserie restaurant combines New York-style preparation with Austin flavors, specializing in brined-then-seasoned, slow-roasted chicken. The birds come fresh from a B.C. farm, are prepared with restaurateur Chris Jones’s secret dry rub and then incorporated into breakfast tacos, savory soups and, always a brunch favorite, waffles. They do branch out into other roasted meats too—the duck confit poutine is wildly delicious. The lobby has a vinyl-record listening station, where you can sift through a collection of classic albums and play your picks on a vintage record player. It’s fun to remember how music used to be played back in the day and rediscover old favorites (hello, Creedence Clearwater Revival!). 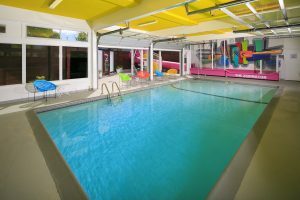 Another unique feature of the hotel is the “Zedinator,” the three-story-high, twisty, bubblegum-pink water slide attached to the pool. You’ll have to decide if you have the guts to go down once you’re at the top—the height is daunting. The 2014 renovation brought a lot of changes to this rundown property and moved it into the modern age. When looking at the next phase, the focus should be on the bathrooms. While they were clean and functional, they did feel a step behind the rest of the hotel’s bold features and one-of-a-kind amenities. We found rooms in October 2018 starting at $106 (US$82). Emma was a guest of the hotel during her stay. The hotel had no editorial input for this review.